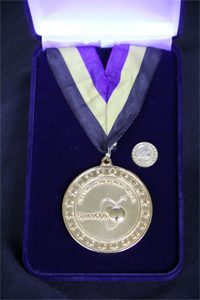 This award is presented to give unique recognition to an individual who has distinguished himself or herself in the field of space operations and support over an extended period of time. The recipient shall be an individual whose illustrious career and exceptional contributions were critical to the success of several space missions or who has made many significant contributions to the field of space operations. 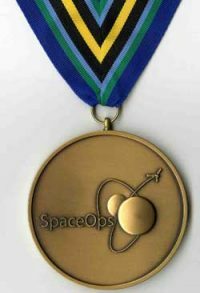 This award recognizes an individual who has distinguished himself or herself to the field of space operations and support. The recipient shall be an individual whose exceptional contributions were critical to the success of one or more space missions or who has made significant contributions to the field of space operations. 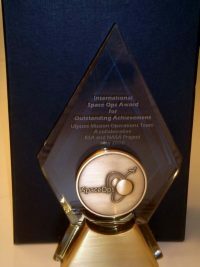 This award recognizes outstanding efforts in overcoming space operations and/or support challenges, and recognizes those teams whose exceptional contributions were critical to the success of one or more space missions. 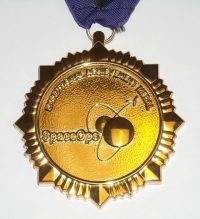 This award recognizes an individual who has distinguished himself or herself with service to the SpaceOps Organization. The recipient shall be an individual who has shown exceptional dedication to the interests of the organization by making significant contributions over an extended period of time. For more information about the major awards and to download the nomination forms, please visit the individual awards pages. 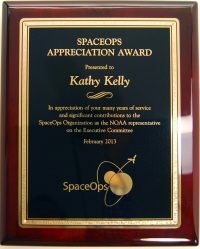 The SpaceOps Organization also presents the SpaceOps Appreciation Award to recognize the contribution of members of the SpaceOps Organization after supporting at least two SpaceOps Conferences and upon their departure from the organization, or to individuals who have provided great service to the organization.